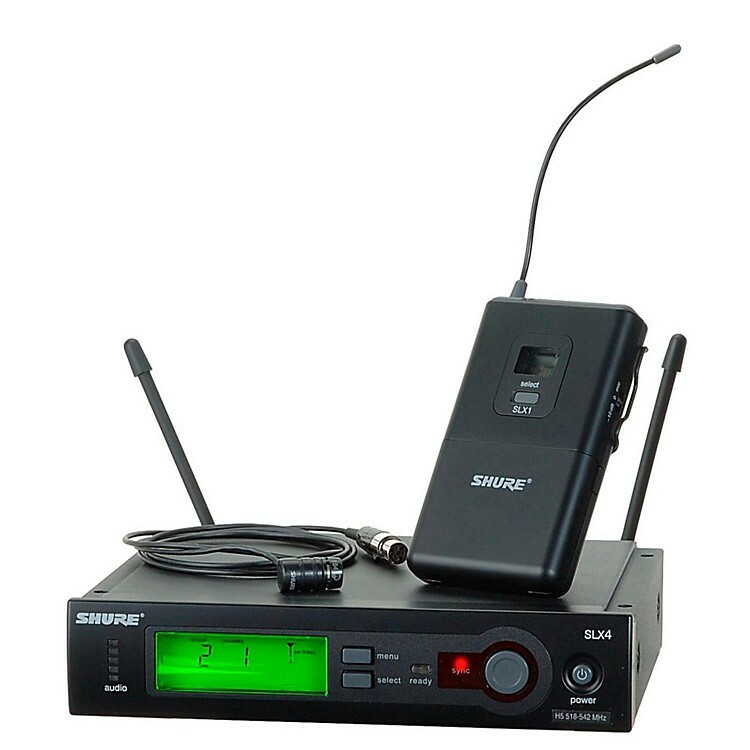 This Shure SLX Wireless Lavalier System includes a Shure SLX4 Diversity Receiver, a Shure WL184 Lavalier Condenser Microphone, and a Shure SLX1 Bodypack Transmitter. The SLX4 wireless receiver is a breeze to use with Automatic Frequency Selection and Automatic Transmitter Setup. With included rack hardware and detachable antennas, it is ready for immediate installation right out of the box. The Shure WL184 Lavalier Condenser Mic is recommended for sound reinforcement applications that require high rejection of ambient noise and pickup angle. Shure highly recommends a windscreen, especially for outdoor events. The WL184 microphone has a 1.2 meter (4 ft.) cable terminated with a miniature 4-pin mini connector. It includes a tie clip that can be rotated in 90-degree intervals for placement flexibility. The SLX1 bodypack transmitter is designed to hold up to the most adverse conditions. Whether used with headworn, lavalier, instrument microphones, or with guitars or basses, the Shure SLX1 transmitter is the definition of reliability. SLX Wireless Systems feature Shure's patented Audio Reference Companding for crystal-clear sound beyond the limits of conventional wireless technology. Order today and enjoy Shure quality. Note: Overall system frequency depends on microphone element. respect to pin 3 of low impedance output) and the tip of the high impedance 1/4-inch output.